On March 2nd, 2019 UFC 235 is set to blow the roof off of the T-Mobile Arena in Las Vegas. The main event of UFC 235 will feature Jon Jones' first light heavyweight title defense since he won it at UFC 232. The challenger is Anthony "Lionheart" Smith who is listed as +750 underdog. Jones needed a one-fight license from the state of Nevada a drug test abnormality prior to UFC 232. 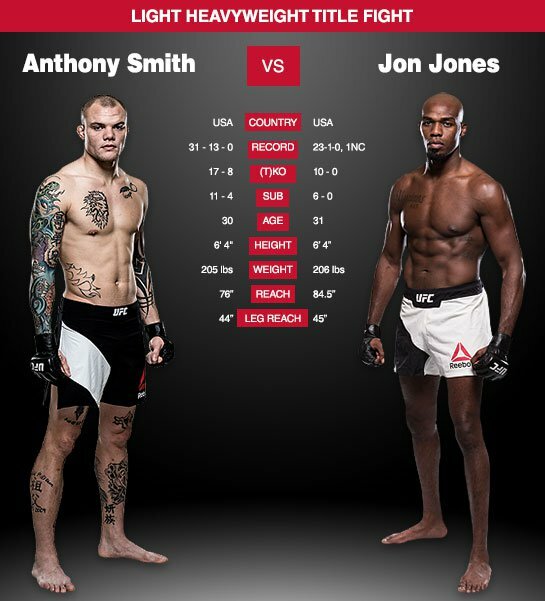 The agreement requires Jones to undergo rigorous testing leading up to the title defense. The co-main event will feature welterweight champion Tyron Woodley putting his title on the line against Kamaru Usman. Are two title defenses on the same card enough? Not this time. UFC 235 will also feature the long-awaited UFC debut of welterweight Ben Askren as he faces the legendary Robbie Lawler. There are two other fights currently on the main card. First a Women's strawweight battle between Tecia Torres and Weili Zhang. Followed by a bantamweight bout between Cody Garbrandt and Pedrio Munhoz. A bantamweight fight between former champion Holly Holm and undefeated prospect Aspen Ladd was canceled. Lenny Fresquez, Holm's agent, said the cancellation is after the UFC failed to extend his clients' contract with the company.